It can be a frustrating time waiting for the lacquer to dry on your cool new guitar body, so this is the perfect time to do some work on the neck. 1. Make sure that the machine heads fit in the holes, and if not, enlarge the holes (remember to remove the machine heads after making sure they fit). 2. Do any final sanding, etc. 3. Apply any decals/transfers to the head. 4. Lacquer the front of the head. 5. Lacquer the back and sides of the head and the neck. 6. Fit machine heads, string retainers and a nut. 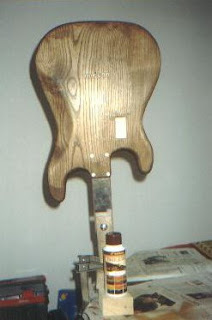 At the top of this post, you can see a picture of the neck after applying decals and a few layers of lacquer. The packs of letters I used for the logo are there too. They're just standard Letraset (although the brand I used is actually called "DECAdry"). 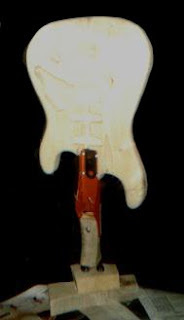 This neck has a rosewood fretboard, which does not require lacquering, so it needs to be masked off. 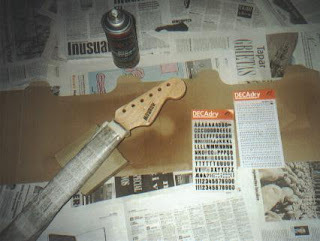 After this stage, the masking paper is removed totally and the neck is then laid face down while lacquer is applied to the back and sides. I found that this method worked really well. 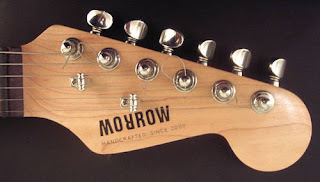 Here is a nice picture of the head of the guitar after all the hardware had been added. I'm pretty happy with it. My surname is Morrow, so I tried to play with this word a little. The upside-down R means that whatever way up the logo is, it looks the same. It's very satisfying to be able to put your own name on the head of a guitar, I have to say. 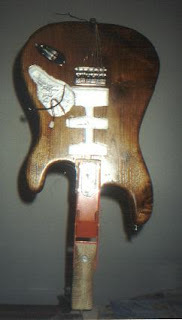 Before you spray your guitar, you should really apply some sort of sealant, otherwise the lacquer (or whatever) will get sucked into the wood like you wouldn't believe. This will make life much more difficult for you and can even affect the tone. So after applying some stain, that's what I did. Just one layer of sealing varnish, followed by a bit of light sanding. Next, it was a case of applying layer after layer of spray-on lacquer. This will probably take longer than you think. I lost count of the number of layers I added, and this was probably due to my not applying the sealing varnish correctly. The wood just kept sucking that lacquer in. Every few layers, you should do some very light wet sanding to try to keep the surface as perfect as possible. If you manage to remove some of the stain by accident, just re-apply it. It's actually not as serious a problem as you might think (or at least it wasn't in my case). Even after many, many layers, you can see how the wood is sucking that lacquer. After this photo, I removed the metal parts and kept going with the lacquer until I managed to get a nice smooth finish. Finishing a guitar is pretty tricky. I suppose if you just want to paint it, then that would be a lot easier, but I wanted to stain mine, then lacquer over the top. This is how I did that. Firstly, I had to construct some sort of holder for the guitar. 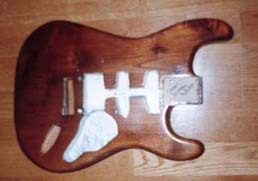 I did this with an old broken wood plane I had lying around, which fitted the neck joint nicely. I then made a wooden handle for it and drilled a big hole down it so that I could mount it on a spindle. Badly as this photo turned out, you can see the stand holding the guitar up. It is sitting on a spindle poking out of the top of a big block of wood, held down by a vise. The theory was that I could freely rotate the guitar body this way, and even lift it off the spindle and hold it by the handle. The first thing I did was to add some water soluble stain. This is just wiped on with a cloth and immediately adds a lot of character to the wood. Here it is after a layer or two of the stain. You can add as many layers as you want. Each one will progressively make the guitar look darker. At this point I decided to assemble the guitar, just to check that everything fitted together correctly. Obviously I would have to take it all apart again to add the finish. I had only acquired one pickup by this stage, but that’s OK. 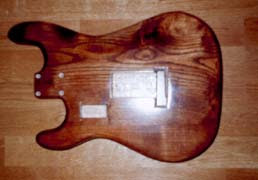 Here are a few pics of the assembled guitar. I plugged it in and it sounded absolutely fantastic. Really, really beautiful sound.